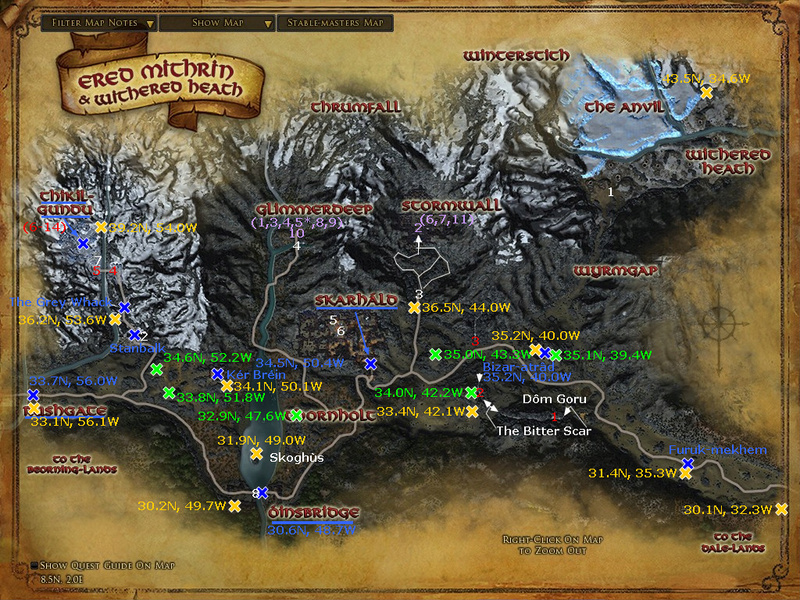 Here's is a complete list of all deeds and places to discover for the new areas. Thanks to everyone who contributed ! If you spot any inconsistency or mistake, please post it down below. Iron hard and iron cold"
Iron hard and iron cold'"
The anvils rang ‘neath Mountains Grey"
To carve a kingdom of their own"
3 On the road to Stormwall (36.8N, 43.7W)"
"O reaches rich with gem and ore! Resplendent runes writ on the door! O kingly crown of ruby wrought! And shone upon their shimm'ring swords'"
That drenched the darkened depths with light'"
Our days drew short ‘neath Mountains Grey"
"Lord Sauron, what a legacy you have left behind! Your servants quarrel and seek in vain for dominion of Mordor, and the would-be Free Peoples pour through the Morannon to pick at your bones. If not for me, your grip on this realm would have slipped long ago." "It was not your loss of the Ring that unmade you, nor the armies of Men, but your pride and pettiness. Ah, but I sensed that weakness long ago... when you hid in frailty beneath Dol Guldur, desperate to wield the dragons that lingered in this realm." "You spoke of a survivor of the Elder Days, a great Cold-dragon: Hrímil Frost-heart. Terrible in size and might, Hrímil had slain the Longbeards of the Steel Keep and now slumbered atop their hoards. It was she you desired above all." "In the halls of the Steel Keep, I learned that Hrímil had remained faithful to your master of old: the Dark Lord, Morgoth. Though you had claimed his title, she thought you a pretender... a failed servant who had imagined for himself some greater purpose." "You were still weakened, Lord Sauron, and when your feigned kindness did not avail you, you thought instead to bend Hrímil to your will. How fortunate you were then that Durin would soon slay her brother, Thorog the Mighty, at Helegrod...."
6 Thikil-gundu instance (22.9N, 136.0W) - On the left as the player loads into Thikil-gundu. "Once again I returned to the halls of the Steel Keep, and once again Hrímil denied you. The loss of Thorog wounded her greatly, but her will remained unbroken. It was then Hrímil swore that she would never serve you, Lord Sauron." "And it was then you learned that Hrímil had devoured the Ring of Power, Tínya, along with the King of the Zhélruka who bore it. Diminished as you were, my lord, I have still not forgotten your fury." "In the depths of Dol Guldur, you essayed to wield your craft-skill anew. You forged a massive chain and etched it with runes of fell magic. For such brazenness, Hrímil would not be your servant... she was to be your prisoner." 9 Thikil-gundu instance (23.4N, 136.0W) - In the centre of Duruz-mazal, the Hall of Faces. On the north ledge above the frozen vault. "Heedless of all peril, Hrímil had fallen into a deep slumber atop the hoards of the Steel Keep. Bound by your chains, Hrímil rose in sudden agony, shrieking as if she were consumed by unseen flame. Though she had devoured the Ring, Tínya still answered to its true master: Hrímil was yours at last." "It would be many years before you shed the guise of the Necromancer, and so I imprisoned Hrímil beneath the razed remains of Barad-dûr to await your return. There, she endured countless tortures, but never did she surrender the Ring." "Upon your return to Mordor, Barad-dûr rose anew and the Gaunt-lords crept out of the shadows of the Elder Days. One among them, Drugoth the Black, wielded the powers of necromancy, and it was then you devised your final vengeance against Hrímil Ring-eater." 12 Thikil-gundu instance (23.8N, 136.0W) - In the Feast Hall. On the right as you enter. "At your bidding, the Gaunt-lords laboured to draw a powerful fell-spirit into this realm. It was to be drawn to Helegrod where rested the remains of Hrímil's brother, Thorog the Mighty. Where Hrímil had resisted, Thorog would now serve in death." 13 Thikil-gundu instance (24.2N, 137.2W) - In the Residential Wing of Thikil-Gundu. Behind Karazgar and next to his boss chest. "And so Thorog served, if but for a moment, and now the Gaunt-lords are banished and Thorog returned to death. You are defeated, Lord Sauron, and the hated Hrímil flies free... but not for long." 14 Thikil-gundu instance (24.9N, 136.0W) - In the Throne Room of Thikil-Gundu, at the Steel Seat (next to the boss chest). "You see, my lord, I will succeed where you have failed. I will turn the children of Hrímil against her, and she will serve me alone! Hrímil once said that you were a pretender, Lord Sauron. I think now she was right." "The war is lost, Thangorodrim broken, the glorious hosts fled. Sister Etterfang and I are the last of our proud line. But it is not over. Oh, no, for we will bring such terrible vengeance upon them... upon them all!" "We will bide our time high up in these mountains. This is a home for dragons. We will feast and gather treasure and grow strong. We will learn to cover where we are soft. But for now, sleep, and dreams of our revenge." "Awakened! Disturbed by little pests, scraping in the walls of my mountain. I can smell them, but I do not know the smell. It is not Men, no, nor Elves, nor Orcs..."
"Dwarves! How busily the noisy little insects carve up my peak, stealing my rightful wealth! They will see how Smaug the Golden welcomes intruders." "Awake, again! What is this? I hear you, Etterfang! My sister is in battle, in pain! Rragh! I cannot reach her, my lair is sealed by fallen stone. Rend with all my fury, I still cannot carve an exit fast enough. Oh sister, sister, burn them all!" "Sister Etterfang is not in her lair. There was a struggle. I see the sheared stone from her thrashing claws, the ground scorched by her breath. The smell of a dwarf! She is still alive, I feel it. I will find you, sister." "The Orcs whisper of a great dragon in the Misty Mountains. Perhaps it is Etterfang. I am loath to leave my hoard unguarded, but I must find her. It is good to stretch my wings and soar." "There is no sign of Sister Etterfang. Men here worship a dragon they name Draigoch. How amusing. Perhaps I will find my own clan of followers, though I so prefer to toy with them and then eat them." "What disturbs my slumber now? Rumbling. Am I trapped again? Grragh! What is this? The heads of five dragon-whelps, left before my cave... dwarf-axes sunk into them? Now, now at last, they have truly wakened Smaug's wrath!" "Sister missing, dragon-whelps slain... I have known only sorrow in these grey peaks. Let sorrow take wing. I am fury, I am vengeance, I am Smaug the Golden, mighty and merciless. I will roam until I find dwarves - and then let them cower before my wrath!" More to come soon Thanks to Hallagon for the Iron veins deed and pages, Velkeirien, Yolli and Geremir for pages, and Thaliruth for treasures ! Last edited by Arkanur; Sep 26 2018 at 04:15 AM. LotRO player and Doer of Great Deeds on Sirannon [FR] since August 15, 2011. Officer of the Children of Arda (Les Enfants d'Arda) kinship on Sirannon and Editor on the French Lotro-wiki (Lotro-wiki.fr). 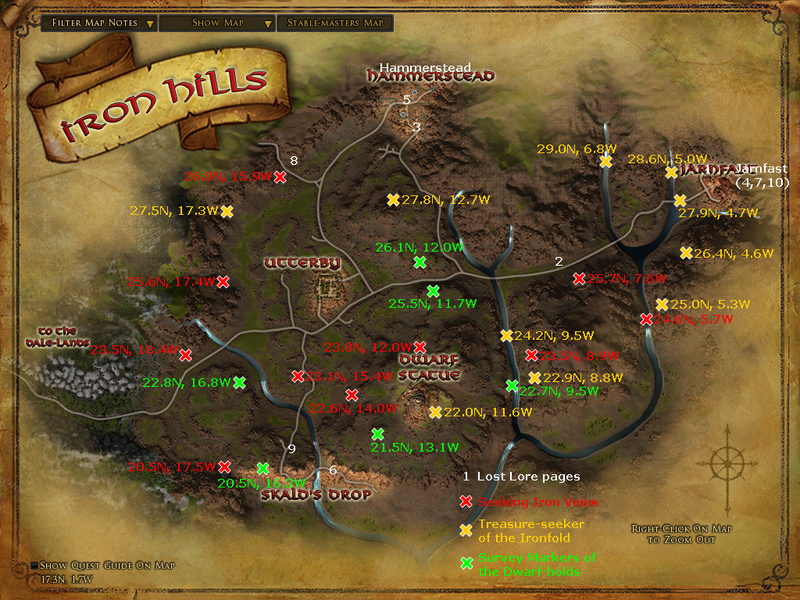 The topic has been updated and now contains all locations for the Iron Hills, as well as a decent amount of Ered Mithrin locations. I haven't been in the interiors yet. The Lost Lores are missing a huge number of pages, if some of you find more pages feel free to post coordinates or indications to reach them. Lost Lore: Ered Mithrin Pages 5 & 6 are located at the very top of Skarháld, which currently appears to be unreachable except by some tricky jumping. There are also teleports to the region dungeons up there, plus a whole interior space with crafting services. The area appears to need some more polish, so it may be blocked off intentionally. Some more page locations. Still cannot seem to find page 1. Page 6: 35.8N, 46.4W -In the courtyard outside Skarháld's keep, on the central platform next to the obelisk. Page 6 23.4N, 136.0W -On the left as the player loads into Thikil-gundu. Page 9: 23.4N, 136.0W -In the centre of Duruz-mazal, the Hall of Faces. On the north ledge above the frozen vault. Page 12: 23.8N, 136.0W -In the Feast Hall. On the right as you enter. Page 13: 24.2N, 137.2W -In the Residential Wing of Thikil-Gundu. Behind Karazgar and next to his boss chest. Page 14: 24.9N, 136.0W -In the Throne Room of Thikil-Gundu, at the Steel Seat (next to the boss chest). 6 - Once again I returned to the halls of the Steel Keep, and once again Hrímil denied you. The loss of Thorog wounded her greatly, but her will remained unbroken. It was then Hrímil swore that she would never serve you, Lord Sauron. 7 - And it was then you learned that Hrímil had devoured the Ring of Power, Tínya, along with the King of the Zhélruka who bore it. Diminished as you were, my lord, I have still not forgotten your fury. 8 - In the depths of Dol Guldur, you essayed to wield your craft-skill anew. You forged a massive chain and etched it with runes of fell magic. For such brazenness, Hrímil would not be your servant... she was to be your prisoner. 9 - Heedless of all peril, Hrímil had fallen into a deep slumber atop the hoards of the Steel Keep. Bound by your chains, Hrímil rose in sudden agony, shrieking as if she were consumed by unseen flame. Though she had devoured the Ring, Tínya still answered to its true master: Hrímil was yours at last. 10 - It would be many years before you shed the guise of the Necromancer, and so I imprisoned Hrímil beneath the razed remains of Barad-dûr to await your return. There, she endured countless tortures, but never did she surrender the Ring. 11 - Upon your return to Mordor, Barad-dûr rose anew and the Gaunt-lords crept out of the shadows of the Elder Days. One among them, Drugoth the Black, wielded the powers of necromancy, and it was then you devised your final vengeance against Hrímil Ring-eater. 12 - At your bidding, the Gaunt-lords laboured to draw a powerful fell-spirit into this realm. It was to be drawn to Helegrod where rested the remains of Hrímil's brother, Thorog the Mighty. Where Hrímil had resisted, Thorog would now serve in death. 13 - And so Thorog served, if but for a moment, and now the Gaunt-lords are banished and Thorog returned to death. You are defeated, Lord Sauron, and the hated Hrímil flies free... but not for long. 14 - You see, my lord, I will succeed where you have failed. I will turn the children of Hrímil against her, and she will serve me alone! Hrímil once said that you were a pretender, Lord Sauron. I think now she was right. I'll make more maps sometime this week. page # 1 - 30.2N, 136.9W (almost immediately after entering the Glimmerdeep, on the right) "The war is lost, Thangorodrim broken, the glorious hosts fled. Sister Etterfang and I are the last of our proud line. But it is not over. Oh, no, for we will bring such terrible vengeance upon them... upon them all!" page # 10 - 39.2N, 47.5W (before entering the Glimmerdeep, on the wall on the left) "What disturbs my slumber now? Rumbling. Am I trapped again? Grragh! What is this? The heads of five dragon-whelps, left before my cave... dwarf-axes sunk into them? Now, now at last, they have truly wakened Smaug's wrath!" Maps are here ! Sorry for the delay. Images are stuck together to avoid triple posting, and may take a while to appear. Maps updated and now complete thanks to Yolli and Geremir! Last edited by Arkanur; Sep 19 2018 at 07:54 AM. I've said it before, and I'll say it again - you legend. Thank you to all those who helped gather this info. Unless one works with Wikis or graphics programs, it is hard to comprehend how much work is involved in what is posted here. Thank you and thank you to everyone who contributed ! There are still a couple pages missing, I'll go back when the next round opens. Got these maps a bit earlier as well fixed and since multiple people are posting now on BR I though I might as well. As you can see they also include the Long-Lost Lore with the exception of interior pages. In my honest opinion you cannot miss them if you run the normal instance from instance panel or resource instance thoroughly. A quick note; resource instances are unlocked after you finish all quests. Or better said when you finish the Quest: State of the Expedition which takes you through all major quests in both Iron Hills and Ered Mithrin. These resource instances give you daily ''Marks of the Longbeards'' for a few quests both inside as outside the instance. The resource instances that will unlock eventually are: Thikil-Gundu, Glimmerdeep, Oinsbridge and Withered Heath. Apart from that you have the normal instances like on t1,t2 and t3(eventually). Long-Lost Lore: Smaug - Writing 5 --> (near 32.0N 136.8W) Can only be found in the resource instance when you cross the LEFT bridge (this bridge is broken in normal glimmerdeep or in the normal instance of glimmerdeep). This might be a last writing you are looking for but this one can only be obtained in the resource instance! All other writings can be found in the normal Glimmerdeep or Glimmerdeep instance on whatever tier. Rest of the writings are either outside or inside Stormwall/Caverns of Thrumfall. As for the Long-Lost Lore: Thikil-Gundu all locations of pages are mentioned above in earlier post as well. Can easily be found in either normal or resource instance of Thikil-Gundu. Feel free to share maps! Last edited by Geremir; Sep 19 2018 at 06:16 AM. Maps and lists above have been updated with Geremir's info. See you for the U24 Beta! 1. "Upon a mountain hill, the lonely peak to your back, a wyrm slithers by your side." 2. "Upon a mountain hill, a sturdy bridge and island touched by our people, a gorged snake below." 3. "In the perilous north, a dragon's horde glimmers in the darkness." Last edited by Yolli; Sep 26 2018 at 02:32 AM. I do not know how many riddles in this quest, if someone has completed, add coordinates, please. Hmm, thanks. I've looked at this a bit, though not enough time to really decipher this quest. I've been to both places, I think; and definitely to the one in the Thornholt, because there is a regular quest that sends you there. I like wandering about the landscape, poking my nose into off-the-beaten-path areas. Nothing triggered, so it seems that you must find the trigger point after picking up the wrapper and finding the locations in order. I also wonder if there is some level gating, too. I was 117 when I hit Dom Goru; but the only quests there that I could get were the ones on the bounty boards. Yet there are other NPCs that could be quest givers were there. So, I moved on to Skarhald and picked up whatever quests I could. Of course, on live, that'll be less of an issue, I guess. Bekar-Mazal POI for the deed also can be reached only inside resource instance. When you are dead, you do not know you are dead. It is only painful for others. OP, this is fantastic, you rock ! !